CHICAGO (WLS) -- U.S. Justice Department officials will announce their findings Friday after a yearlong look into Chicago police conduct. There is a template for what to expect -- and it is in place 700 miles away in Baltimore. Although justice department officials, Mayor Emanuel and CPD leadership claim they know nothing about tomorrow's federal announcement on police civil rights violations, the Chicago police findings are likely to be very similar to what DOJ officials determined in Baltimore. "I know that after two years we take a look at where we are and then after five years where we are," said Baltimore Mayor Catherine Pugh. 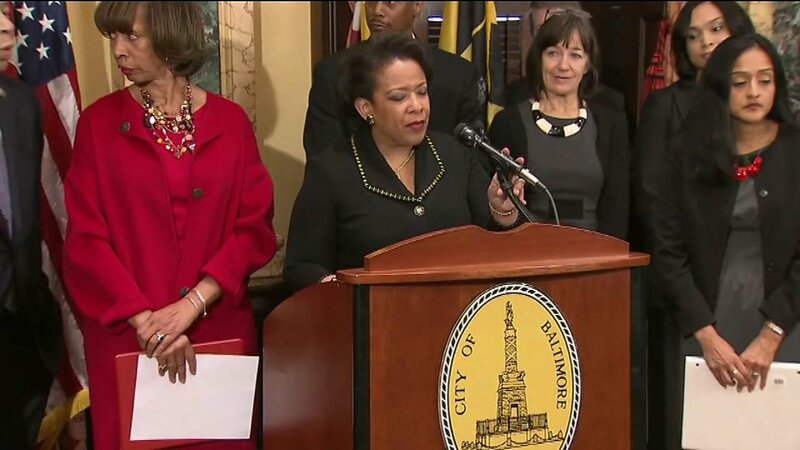 On Thursday it was the mayor of Baltimore and U.S. Attorney General Loretta Lynch announcing DOJ oversight of the Baltimore Police Department. Friday morning it will be Mayor Rahm Emanuel standing with Lynch in Chicago. "I don't know anything in the report, i don't know one section of the report," Emanuel said. Even as Emanuel claims to know nothing, a justice department civil rights report handed to Baltimore officials last August may be the best framework for what to expect. After years of brutality and misconduct allegations against Baltimore police and the death of Freddie Grey while in custody, the DOJ found widespread problems. Stating last summer that Baltimore police violated free speech and search and seizure amendments to the constitution; broke U.S. anti-discrimination laws, made unjustified stops, searches and arrests; targeted African Americans for stops, searches, and arrests; used excessive force and retaliated against citizens. In Chicago, following the police shooting death of black teenager Laquan McDonald, U.S. justice officials opened a "patterns and practices" investigation identical to the one underway in Baltimore. Although the examples and specific cases will be different in Chicago, the tone and substance are likely to be similar to what was found in Baltimore, where Thursday Lynch announced a consent agreement; federal oversight to repair the police problems. "This agreement is robust, it's comprehensive, and it includes a range of reforms to achieve our three main goals...first to assure effective and constitutional policing. Second to restore the community's trust in law enforcement and finally, to advance public and officer safety," Lynch said. If that kind of consent decree happens in Chicago, it won't be Friday. The announcement will be findings of Chicago police practices. Actual federal oversight of the police force in Chicago would be months or a year down the road, following negotiations with city officials as to how to make it happen.